The coconut palm (Cocos nucifera) is thought to be native to the warm climates of Polynesia, Malaysia and southern Asia. The trees bloom and bear fruit throughout the year, growing a new flower spike nearly every month. This then becomes a cluster of six to twelve nuts. The nuts are the largest seed known to the world, and can take up to a year to fully mature. The tree can yield two hundred coconuts. Our extra virgin coconut oil is extracted from the inner flesh of the coconut. We buy from the Indonesian island of Nias, where the coconut groves help a local community at constant risk from earthquakes and tsunamis. 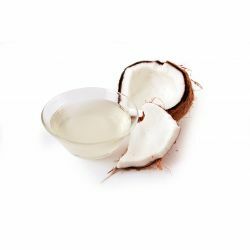 When applied topically, coconut oil can reduce the symptoms associated with psoriasis and eczema, as it gives a natural balance to the skin. We use extra virgin coconut oil in our Coconut deodorant powder as a binding agent, keeping all our ingredients together.